How much does it cost to travel to Greenland? How much money will you need in Greenland? kr1,420 ($214) is the average daily price for traveling in Greenland. The average price of food for one day is kr400 ($60). The average price of a hotel for a couple is kr1,558 ($235). Additional pricing is in the table below. These average travel prices have been collected from other travelers to help you plan your own travel budget. 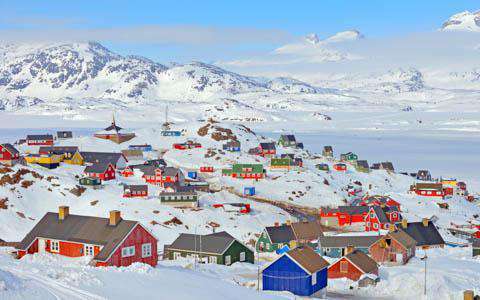 Greenland is the largest island in the world that is not its own continent. It is located in the far northeast of North America and is mostly found within the Arctic. It was granted self government from Denmark in 1979 and then more recently voted for autonomy as its own country with only formal ties left to Denmark. Currently, Copenhagen is still responsible for foreign affairs but many people predict that eventually Greenland will have full independence. Greenland is about the size of Mexico, although looking at it on a flat map can be very misleading, as it looks about the size of Africa. It also has the world's lowest population density. Particularly in the small towns, there are very few signs for restaurants or hotels, so you may have to ask where you can eat or stay. Nobody will mind giving you directions as they likely know where everything is and are often eager to help. Southern Greenland is jokingly called the "banana coast" by locals as this is where you will experience the least extreme temperatures, although it is still bitterly cold. It is also the most accessible part of Greenland. This area has many beautiful fjords and mountains, as well as flowering plants and fertile land, all next to icebergs and glaciers. Western Greenland is what is typically thought of when one envisions Greenland. There are dogsled trips, houses with with fish and sharkmeat hanging out front, and large icebergs floating in the ocean. Eastern Greenland is sparsely populated, even by Greenland standards and Northern Greenland is predominantly occupied by Northeast Greenland National Park. Although there are several cruises that visit Greenland, in general, flying is your only way to reach the country. Trans-oceanic flights arrive in either Kangerlussuaq or Narsarsuaq. This limited accessibility mean that traveling to Greenland is quite expensive. Travel agents may be your best option when arranging flights because they occasionally know of discounts through Greenland Tourism. Once you're in Greenland, it can be a difficult place to travel around. The sparse population and a lack of infrastructure mean that many parts of the country are completely inaccessible. There is no road or rail system, so the easiest way to travel is by plane. Air Greenland is the best domestic airline. During the summer months destinations between Narsarsuaq and Uummannaq on the west coast can be reach by Arctic Umiaq passenger ships. The official language of Greenland is Greenlandic. This is most commonly used along the western coast, but in the east the dialect is slightly different. Both languages are quite difficult to learn due to the challenging pronunciation. Almost all Greenlanders also speak Danish and some have a decent understanding of English. It's worth trying to learn a few words in Greenlandic though as this can greatly improve your experience. The official currency of Greenland is the Danish Krone. In touristy areas the Icelandic krona, Euros, Sterling, and US Dollars may also be accepted. While the number of places that accept credit and debit cards continues to rise, Greenland is still predominantly a cash economy. Hotels and major chains may take credit cards, but otherwise it's best to be prepared to pay with cash. Every town has at least one ATM and many banks will give cash advances on credit cards. There are some fascinating souvenirs you can buy in Greenland. Inuit art and crafts are interesting. Sealskin is made into belts, purses, coats, and almost anything else. Duty free items are also available including alcohol and cigarettes. Ilulissat Icefjord: This fjord is located in western Greenland and is well worth a visit. It was declared a UNESCO World Heritage Site in 2004. The Midnight Sun: In the northern two thirds of Greenland there are several days to weeks during the summer months when the sun does not set. The summer solstice, June 21st, is a national holiday. It is a truly unique experience to be somewhere that the sun does not go down. During the winter months the reverse is true and it is always dark. Norse Settlements: It is possible to see the remains of several Norse Settlements in Southern Greenland. In Igaliku there are the remains of a Greenlandic cathedral and a reconstruction of Thorhilda's church is seen in Qassiarsuk. Cuisine in Greenland is historically made with the meat of marine mammals, game, birds or fish. There is a significant amount of protein in the traditional dishes. After colonization the cuisine was greatly influenced by Danish and Canadian cultures. Restaurants today often have a mix of traditional dishes and more international options. During the summer months it is not uncommon to eat outdoors. Suaasat: This is the national dish of Greenland. It's a traditional soup that is usually made with either seal or whale, reindeer or sea birds. It also has onions and potatoes and is flavored with salt, pepper and a bay leaf. It can be thickened with either rice or soaked barley. Ammassat: Seafood in Greenland is often smoked. In particular, this fish is a favorite. It is in the salmon family and is easily dried. Arfivik: This is a popular dish made with Bowhead whale. The whale meat is smoked and served with onions and potatoes.